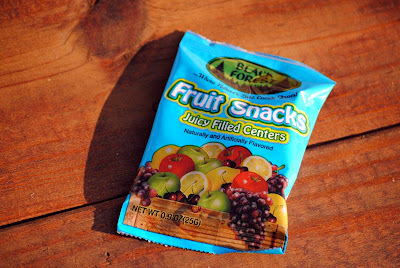 Yes, I have a blog entry dedicated to fruit snacks. I know it is strange, but I’m okay with it. These are the BEST fruit snacks. Ever. They came into our lives through Luke’s teacher who gave them out one day to all her kids. I knew they must have been better than run-of-the-mill fruit snacks when Luke talked about them nonstop for five minutes after hopping into the car after school. He went on and on about the fruit juice in the middle, and how it was REAL juice. After he stopped the fruit snack chat, he reached into his backpack and pulled one out for me! He said they were so good that he saved the last one for me to try. AND he saved the wrapper so I could buy him some. The boy was not kidding, the fruit snack was delicious and the juice in the middle was so, so scrumptious. I could not find them anywhere, and had sort of given up on locating them. Then out of the blue, they were on a display at the Kroger by our house. Luke was so thrilled that he could hardly contain himself and we bought a box. We all became addicted to fruit snacks. The box was quickly void of all the fruit snack yummy goodness. And that is when I discovered that our Kroger does not carry these fruit snacks on a regular basis. Fast forward a few months…..and I had to run to Kroger for something the other night. Well, honestly I did not run. Who am I trying to kid. I drove my car. And as I was looking at the goodies on the Easter aisle, I saw sitting on the shelf an entire display of the fruit snacks. I bought a box. Hello Black Forest Fruit Snacks. Welcome back to the Stewart house! However, as I sat at my desk eating a package of fruit snacks, it occurred to me that the box is not going to last long. I really should have bought another box, or six or seven. Which brings me to the real reason for this blog entry…..does anyone know a place that carries these divine fruit snacks all the time?? Target, Tom Thumb, anywhere?? I really need to know. And if you have not tried them, you should! They are filled with fruity juice that makes your mouth happy as can be.